If you’ve been looking into a bachelor’s degree, you probably noticed there are two main kinds: bachelor of arts (BA) and bachelor of science (BS). But BA degrees aren’t just found in art-related fields and BS degrees aren’t relegated to science-related fields. So is there a difference between a BA and a BS? The short answer is yes. The long answer is . . . kind of. A bachelor of arts and a bachelor of science are both four-year college degrees, and there can be a lot of overlap in the actual courses you take. And even the general differences we’ll highlight below have plenty of exceptions. But broadly speaking, the difference is in how each bachelor’s degree approaches a topic. Now let’s look at each degree in a little more detail. A bachelor of arts program tends to give you a broader understanding of the field you’re majoring in, providing you with courses in the key subject areas and supplementing them with a strong foundation in the humanities—requiring courses in social sciences, communications, history, language, and English. BA programs may also require more elective credits, allowing you to explore a related field, pursue a minor, or study additional topics that interest you. A bachelor of arts degree may be the better option if you know the field you want to get into, but don’t have a particular career in mind. Courses in the humanities can make you a better communicator, improve critical thinking and creativity, and provide other benefits that broadly apply to many careers. It’s often easier to add a minor—or even another major—by using your electives to meet the criteria for another program. There are usually fewer specialization options. This tends to be a more technical degree, with more advanced courses in your field of choice and a more in-depth education in a particular area. A bachelor of science may also offer a more clearly defined path than a bachelor of arts, with a larger portion of required courses. Technical and science-related fields are more likely to offer a BS degree than a BA degree. A BS degree could be the better option if you know exactly what kind of job you want. The specialization options let you focus your curriculum on the part of your field that matters to you. Some people appreciate having a more clearly defined path to a degree. A bachelor of science can sometimes provide a straightforward course schedule, letting you comfortably progress through the program. Fewer electives and less flexibility means you could have less freedom to pursue other subjects that interest you. Some BS programs may actually be so specialized that they require you to already have a degree of some sort before you can enter the program (this is relatively rare though). So we gave you the quick answer: a BA is a more general education, and a BS is a more specialized education. The perceived difference between a bachelor of arts and a bachelor of science is often highly subjective depending on the company or recruiter who looks at your resume. 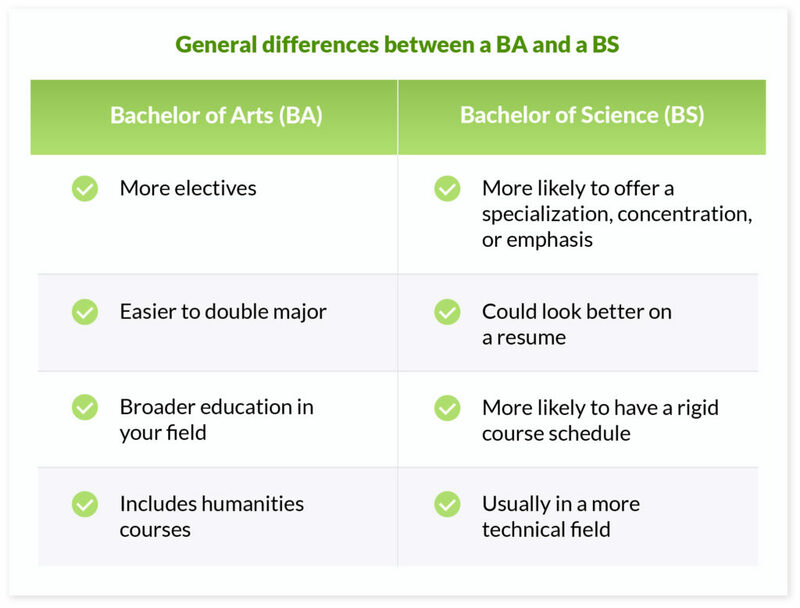 And the actual difference between a BA and BS varies widely from school to school. Even within a school, the difference in curriculum can be pretty ambiguous, and there’s often a lot of overlap. Oh, and you rarely have to choose between the two. A lot of schools only offer one or the other in a particular field, so all you really have to choose is the field you want to study. That’s certainly not always the case, but even when it’s not, you really don’t have to stress out about this. Since the difference between a BA and a BS varies so much from school to school, you can’t really accept a pat answer to this question. No philosophical difference between the two degrees is universally true. That being said, there are some broad employment comparisons that can be valuable. The biggest differences between a bachelor of arts and bachelor of science degree is found on a field-by-field and school-by-school basis. Most likely, the difference will be more in curriculum than in how your degree is perceived by potential employers. We can, however, lump everyone together and see what a BS or a BA could mean for your career. According to Emolument, a salary comparison tool, right out of the gate Americans with a BS degree earn about 17% more on average than those with a BA degree. The technical skills often associated with a BS are in high demand. For the first 10 years of experience in the field, BS degrees have the edge. Over time, however, the gap closes—then goes the other way. After about 15 years of experience, that broad education and courses in the humanities can become an advantage. As we said earlier, there’s a high demand for the technical skills and expertise a BS degree typically represents. However, I would imagine that this comparison is more relevant to BS and BA degrees as a whole—I don’t know that it speaks to the difference between a BS and a BA in computer science, or other fields that offer both degrees. Employment rates vary widely from school-to-school (surprise, surprise), and unfortunately many schools don’t even report them, because they aren’t required to. But when they do, BS programs tend to have a slightly higher employment rate. What if a school offers a BA and a BS in the same subject? This is really the only situation where you’ll need to consider the difference between a BA and a BS—and the solution is pretty straightforward. When this happens, you have to look at the programs at that school side-by-side. If you compare the courses and requirements, you might find that the difference is really just a couple of classes—usually swapping electives for a concentration, specialization, or emphasis. And you might even be able to use your electives to make a BA program include what you’re missing from the BS program, or vis versa. Hopefully by now you’ve realized that the difference between a bachelor of arts and a bachelor of science probably isn’t going to make or break your career. That being said, if you need help deciding between these two four-year degrees, here are some tips. Before you really consider the pros and cons of a BA vs. a BS degree, you should have some idea of the kind of career you intend to pursue after school. Ideally, you should figure this out before you start taking classes (being an undeclared major gets pricey fast). But even if you’re already well into your college education, focus on your end goal. Do you want a more specialized role in an organization? Are you interested in holding a leadership or management position? These kinds of questions should help you decide which kind of degree is most likely to give you the skills and expertise you need to be successful in that field. If you’ve already chosen a school or started attending classes, you probably won’t even have to think about choosing a BS or a BA—just choose your field. You’ll receive whatever designation your school offers for that degree. Most schools are stronger in certain programs than others. And some schools have a regional, national, or even international reputation for producing exceptional students in a particular field. A degree of any kind from a school with a good reputation in that field is going to have a bigger impact than whether that degree is a BA or BS.. When I graduated high school, I almost went to the Colorado School of Mines to join their wrestling team. They’re a phenomenal engineering school with a great reputation. But there was one problem: I didn’t want to be an engineer. I wanted to study English. So I went somewhere else. Does one provide specialization options? Do you want those? Does one appear to be more challenging than the other? Do you want to pursue a minor or double major? Which degree gives you the flexibility to do that? Are some courses only available in one program? Do you want to take those courses? Does one program include internships or other opportunities that could help you land a job? A BS probably isn’t going to give you a huge advantage over other equally-experienced job candidates with BAs, but if a hiring manager is going to favor one degree over the other, they’re almost sure to favor a BS. Again, choosing a quality school and having a degree in the right field is probably going to have the biggest impact besides your relevant work experience, but people are more likely to be biased in favor of a BS than a BA in a technical field. I know I probably sound like a broken record at this point, but since the differences between a BS and a BA are so dependent on your school, you probably want to talk to someone who’s intimately familiar with the two programs—or who can connect you to someone who is. You can probably get a good enough feel for the programs by exploring them online, but if you have questions, ask them. Choosing a degree is a big decision, and if it’s going to affect the next several months or years of your life, it’s worth taking the time to choose wisely.